Hello everyone! I know I promised to post about the first look from the teaser photo I uploaded last night. But i think it is more important that I share this news with you. 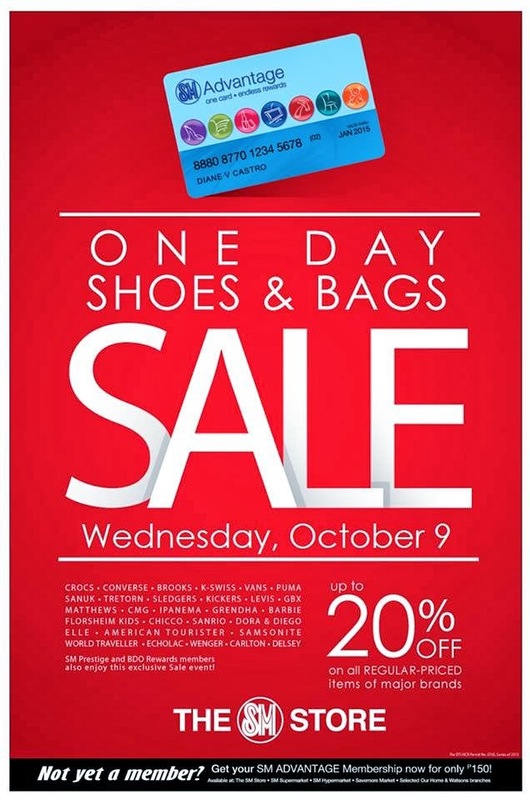 SM Store is again having Shoes and Bag Sale for tomorrow! Yes, that's right. It is just a one-day sale. So if you are planning on buying a pair of shoes or a new bag, then you might want to visit the nearest SM Mall to see if you will find something that you would like from those available for the sale event. 20% off is a good deal already. I'll might check this one as well so see you there if ever. Happy shopping! hi marcela! sure! I already followed you on GFC. i'll add you in bloglovin as well. thanks! shayne! I was not able to buy one :( no more stock for the color that I wanted.